Now I wonder... would it be possible to create customizable puzzles... ? For instance, the first one, in Lomond, is a simple labyrinth. Maybe someone could create a puzzler.ccn file which refered to a .ini file and looked up the puzzle of the number #. Then there could be a type parameter called labyrinth and some parameters in the same way that the tilesets are "encoded" (or whatever it is called) in the Planet.ini files. Wow.. that would be awesome. If anyone with MMF2 could try out something like this it would be awesome. Your idea really sounds like it could work. Also the programing puzzles from Goldschmidt could be drawn in a similar way. As long as the puzzle has a standard I guess they'd be customizable. Actually, the .ini format might not be as good as just a simple ASCII format (as in, without the Row 0= stuff), because unless the variables can be stored in RAM as a list of key-value pairs like it appears in the .ini, then all puzzles would have to use the same variables. So, for instance, if we were to use the example format you used here, then we would have to find a good, logical way to adapt all the various types of puzzles to be stored in up to 16 "rows". Actually, I would prefer a binary format even more (more compact file, and easier for a program to read), but only if we would also make a puzzle editor; actually going into a file with a hex editor is too annoying. Well, I'm not the genius who can do it. I just got the idea. If it works, I don't care how it's written as long as it's sensible. I'm gonna download the MMF2 demo. This version of Multimedia Fusion 2 is a demo version. This version is limited to 30 days and doesn't allow you to build stand-alone applications, screen savers, nor Internet applications. If you want to continue using Multimedia Fusion 2 after the 30 day period, you must purchase the full version. If not, then I guess I'll at least get a chance to look at them with this software. I can't open the Puzzler MFAs included with the Editor. There was something about some extensions which were needed for Nifflas' work. INI++ is made by ClickTeam, the makers of MMF2. And, unfortunately, all extensions made by ClickTeam come in the form of update installers for MMF2, and these updaters do not recognize Demo versions. So, in other words, I need the full version of Fusion to open the puzzles. I'm back in business. Huge thanks to Smeagle! The errors are gone, and I can mess around with the puzzles now. I'll certainly look into whether or not I can change the puzzles to load from an external file. as these are pretty much essential to traveling. I don't think we can avoid using them. dont you just place them in the editor? and set the maximum charge? No, it appears they behave as puzzles. 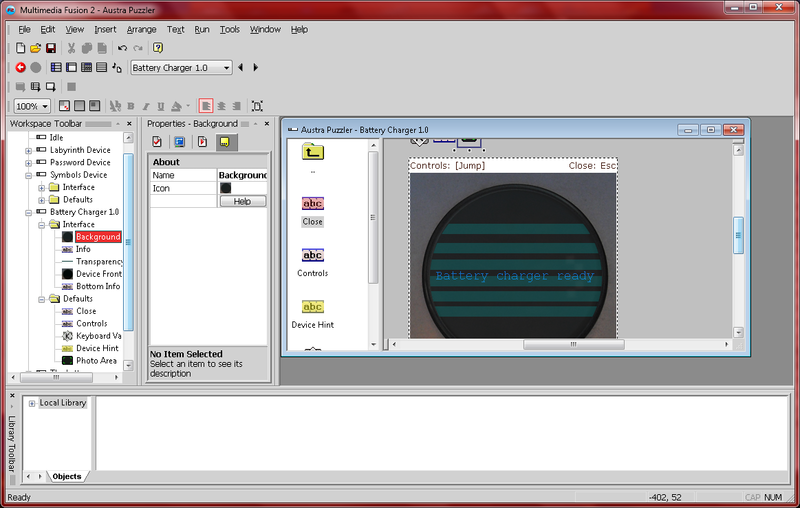 in the .mfa of puzzles, one of the puzzles is "battery charger" and it is the sceen you see when using it. i think you can set it there. i made the laser maze thing longer+with a switch you need to hit before going to the end! Is is really good idea and everyone will be able to make puzzles!